What do you get when you mix a sheep and a cow? A strong-selling upscale pickup, Chrysler hopes. In the first quarter of 2011, Chrysler will steer its most expensive pickup ever into showrooms: the Ram Laramie Longhorn. The mixed-metaphor name is a bit odd, reminiscent of the mythical jackalope that roams the Western prairies. As everybody from Laramie knows, a Ram is a sheep, and a longhorn is a cow. 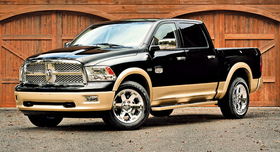 The Ram's-head logo, with its curly horns, will appear on the truck's grille, while some Western-style badges with a representation of a longhorn steer will appear elsewhere. But Chrysler isn't the first to combine two different species in one name. Remember the Ford Mustang Cobra?